Schneppgroup images by Zoe Schnepp is licensed under a Creative Commons Attribution-ShareAlike 4.0 International License. 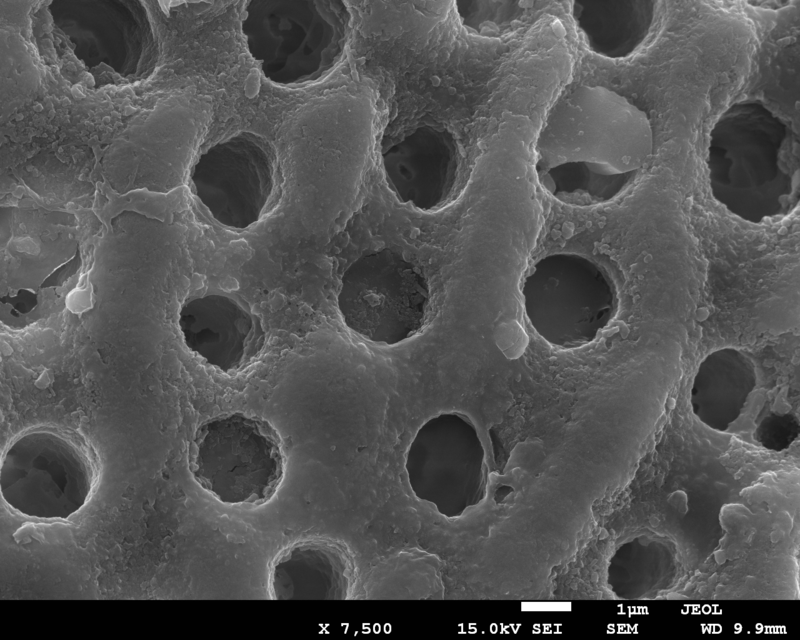 This is very much a work in progress but I’m hoping to expand it to be a free repository of scientific images. I hope my readers find it useful for outreach, public engagement and education. 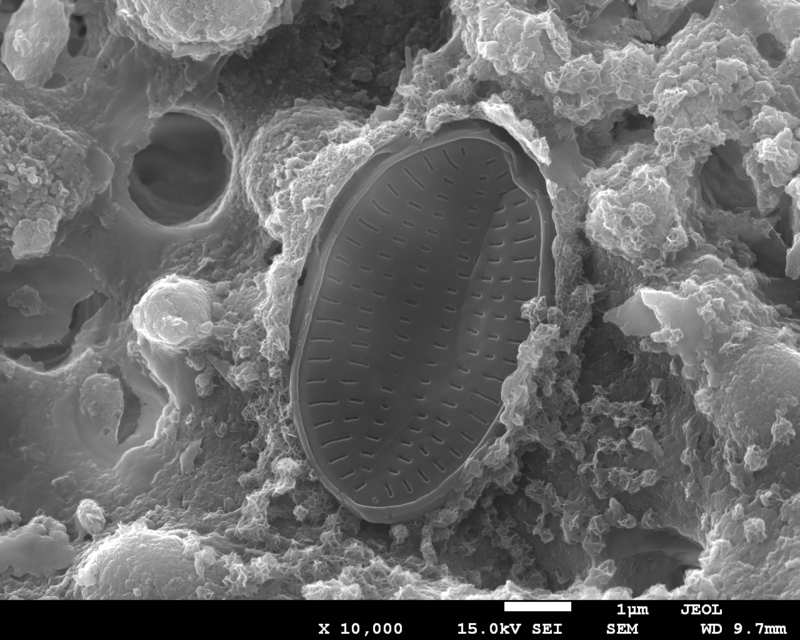 I’ve had a lot of fun with photos of my samples, or recolouring some of my images taken from the electron microscope. The celery image is just that – a simple experiment you can do at home to show how plants carry water up to their leaves is to dip a celery stick in a glass of water with some food colouring. 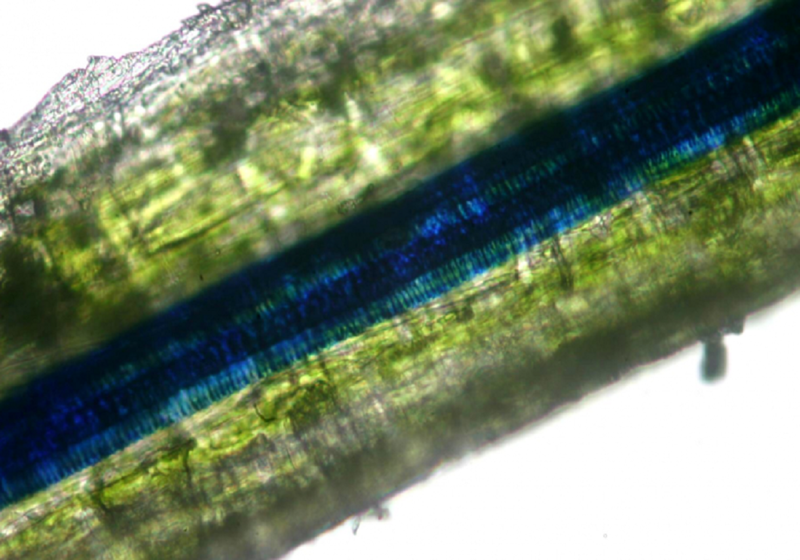 I used blue food colouring, then stripped out one of the veins and got some nice photos on the light microscope! If you open the full size image, you should see horizontal lines, across the blue vein. 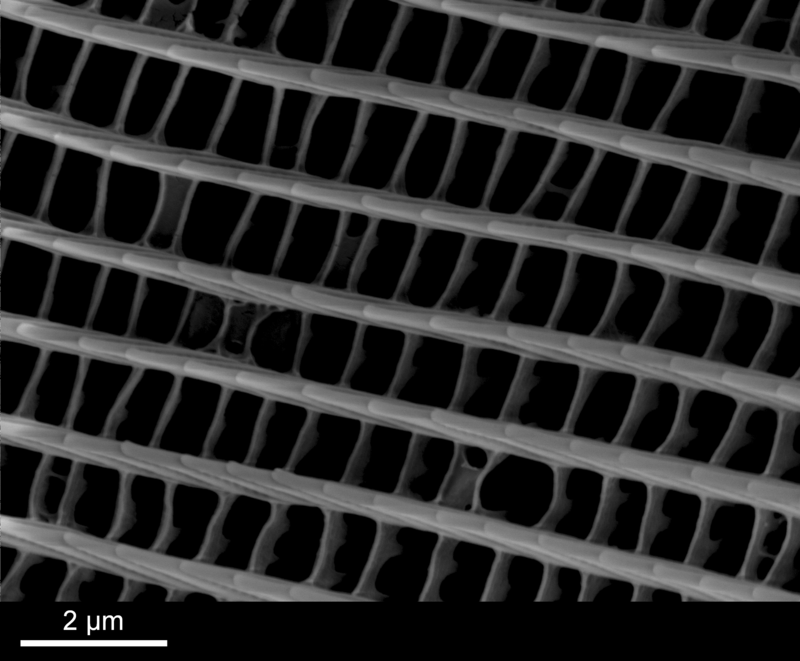 The water vessels (xylem) in plants need to be very strong to withstand the large capillary forces of water travelling up through the plant. 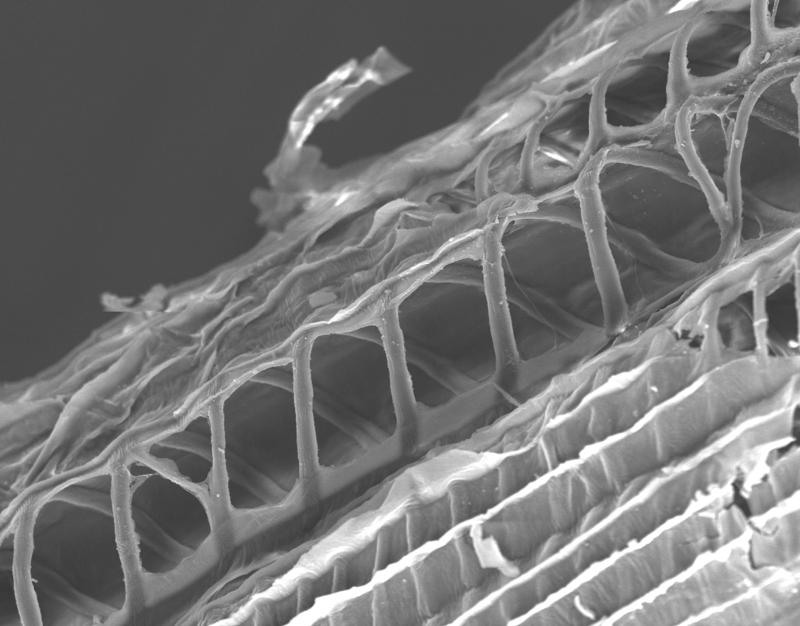 In the same way that our own windpipes are strengthened with rings of cartilage, the xylem in plants often have a more complex structure than simply a tube. 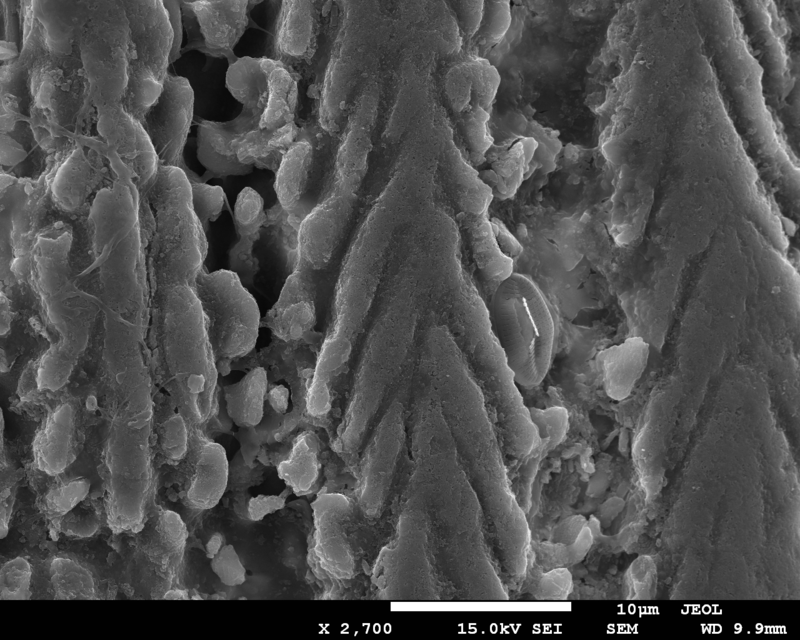 The celery xylem are strengthened by helical structures which are rich in lignin. 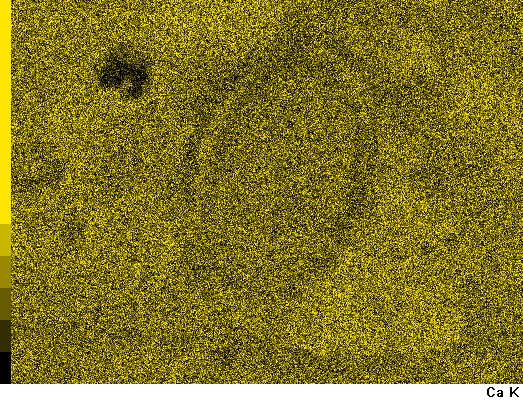 The second image is a little more abstract – the original image was some metal oxide platelets, viewed on a transmission electron microscope. 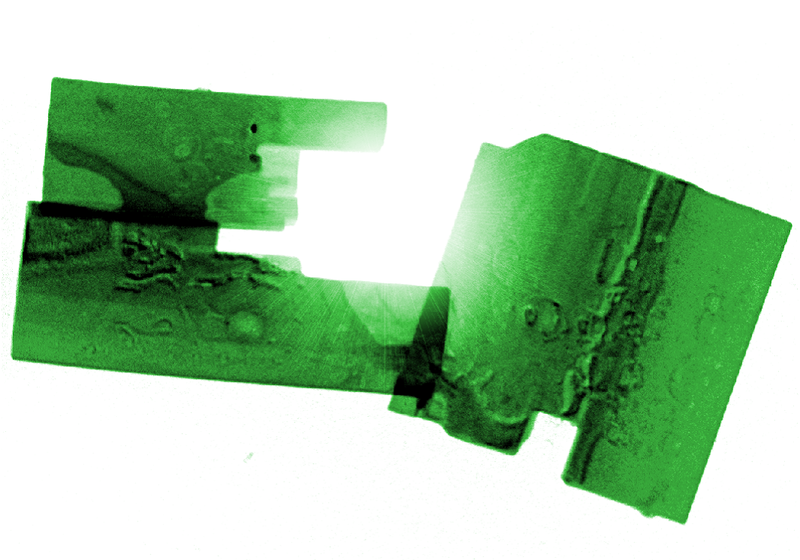 I inverted the image then false coloured the platelets green. Then a bright spot in the middle and the idea is sun reflecting on the surface of a pond between some water lilies! 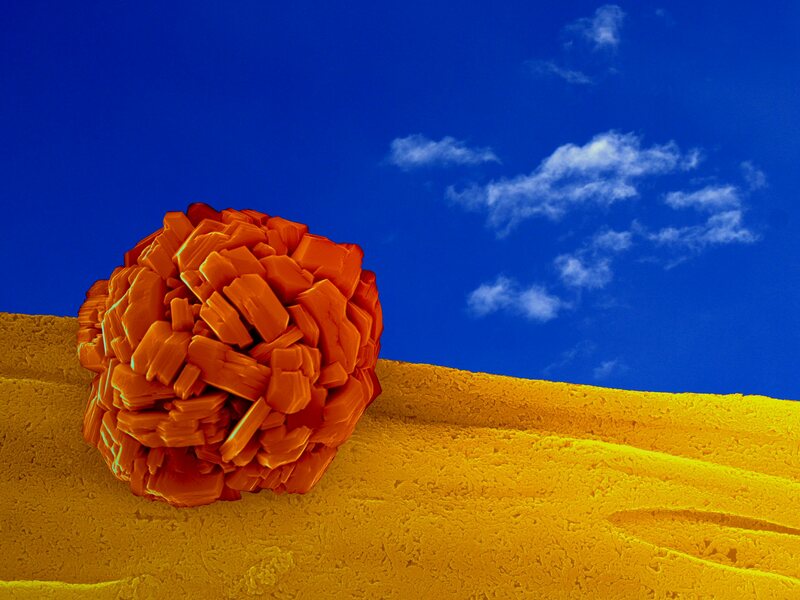 Image 3, titled ‘Desert Rose’ is a cluster of tungsten oxide crystals (deep orange), grown on a carbon surface (yellow). 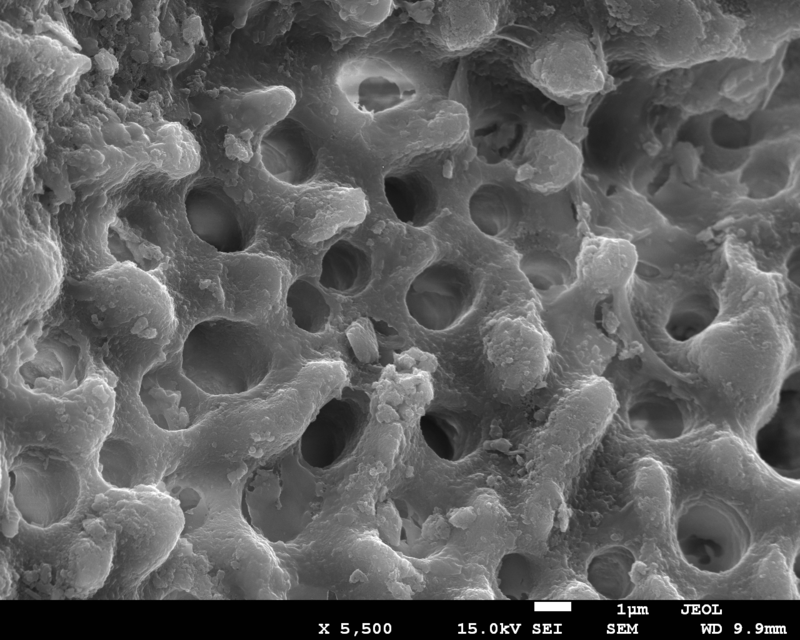 This was taken on a scanning electron microscope. Nanosushi was a lot of fun to design. 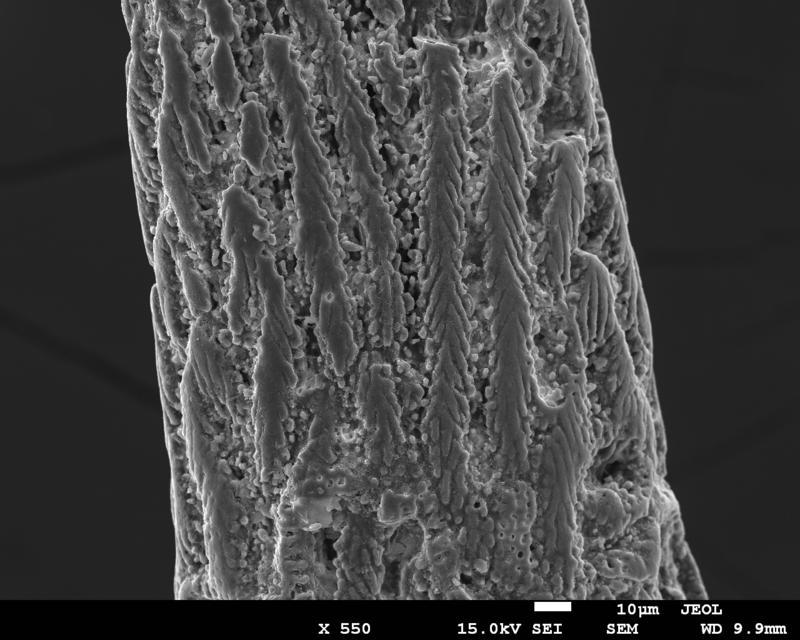 The original image was a scanning electron micrograph of some nanowires of a material called lanthanum strontium manganite (La0.67Sr0.33MnO3). 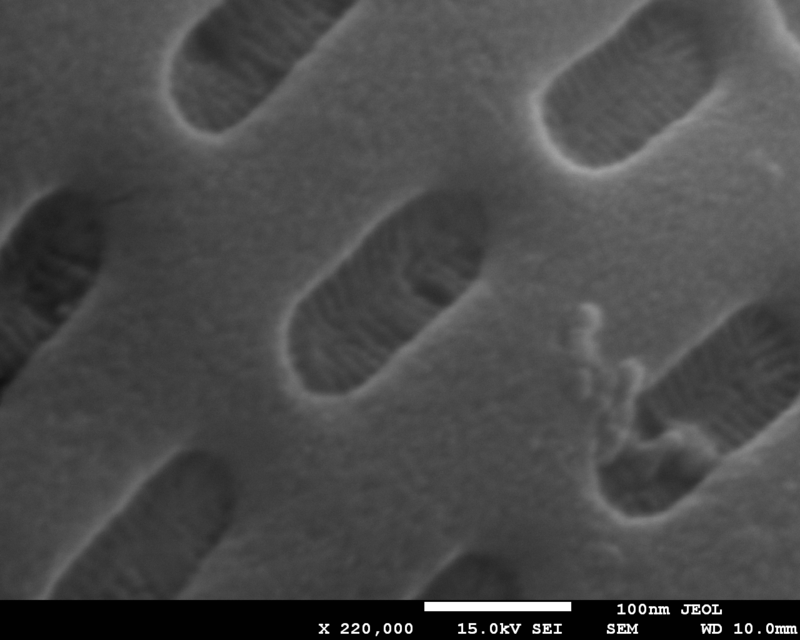 This material has some fascinating electrical and magnetic properties and we were interested at the time in finding out whether it could be synthesized using a sol-gel route into different morphologies. We were invited by the journal who published the work, CrystEngComm, to submit a front cover and nano-sushi was the unsuccessful submission! 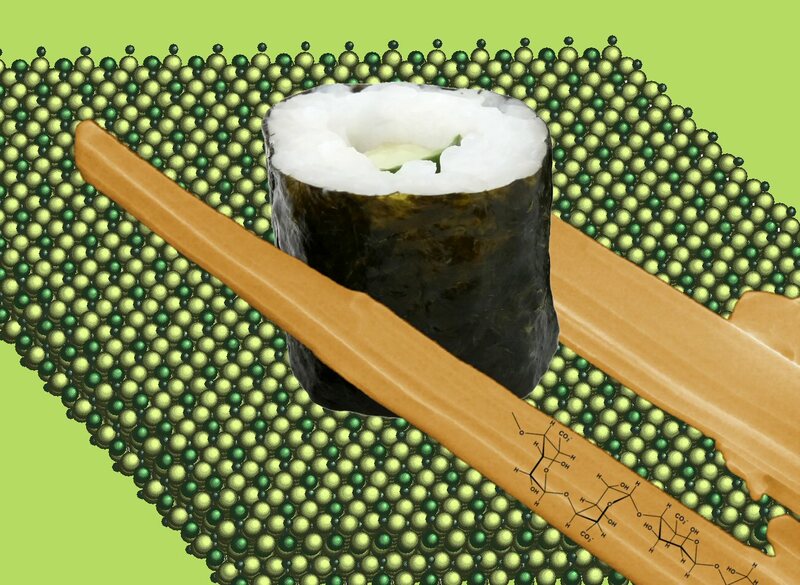 The chopsticks are false coloured nanowires and the sushi is just a cucumber roll. Then for the ‘bamboo rolling mat’ I generated a model of the LSMO structure and coloured the atoms in various shades of green. It’s one of my favourite images! 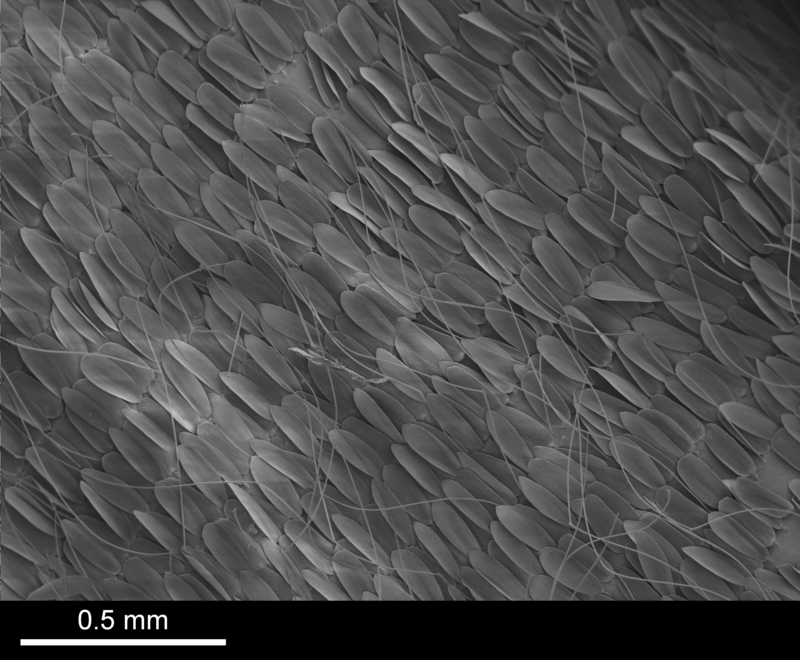 The final image at the moment is a sample of europium-doped strontium titanate that I made using a simple sol-gel prep. It is true colour. 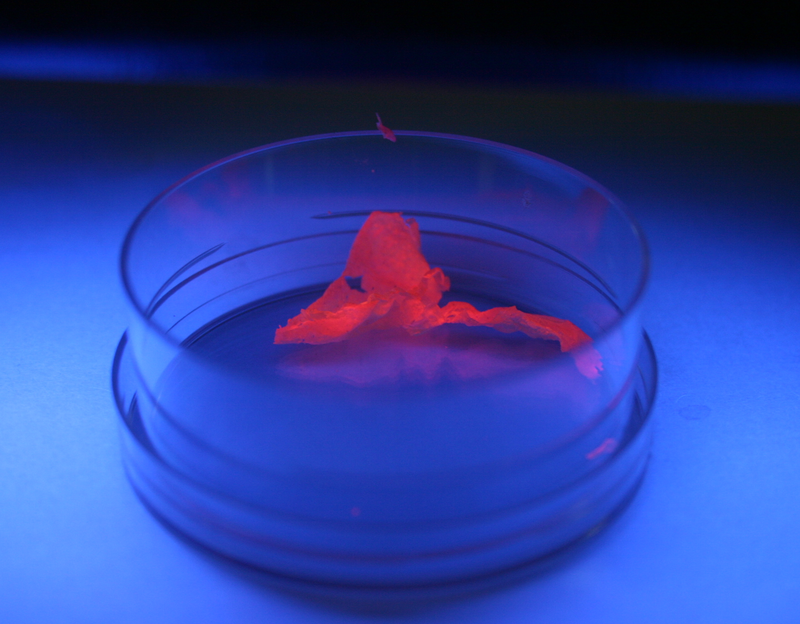 Under normal conditions, the sample is an off white colour, but under a UV lamp (as in the photo), the sample undergoes photoluminescence. The photons of UV light are absorbed and electrons in the sample are excited to higher energy levels. When the excited atoms ‘relax’ back down to lower energy levels, they give out photons. The emitted light is of a specific wavelength, in this case giving a characteristic orange colour that looks a little like a flame. Some living creatures create remarkable iridescent colours, for example peacocks and butterflies. Normally when we observe colour, it is due to molecules or ions in a material that interact with light. However the iridescent colour in the wings of some butterflies is caused by scattering of light by a regular (or periodic) structure within the wing. 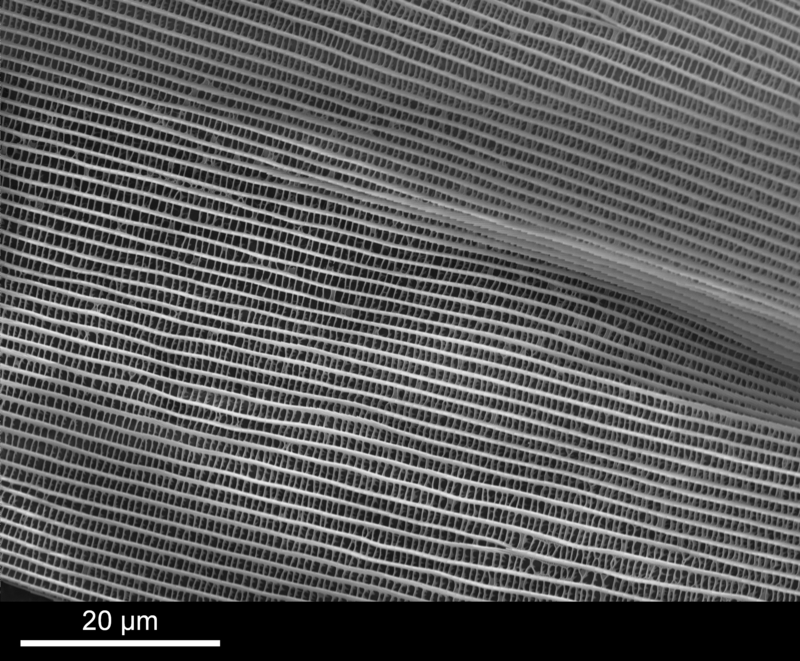 The structures that scatter light in this way are called photonic crystals – find out more about natural and man-made photonic crystals here and here. 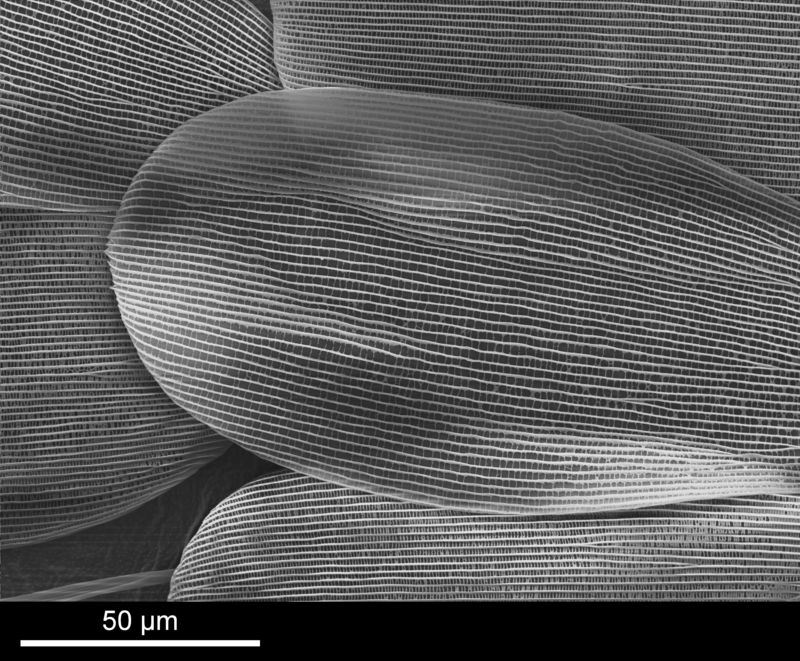 I don’t have any pictures yet of the photonic structure, I’ll need to do some freeze-fracture of wing scales, but here are a few scanning electron microscope images of the surface of a butterfly wing. Many thanks to the Stratford Butterfly Farm for donation of a Morpho peleides butterfly. No butterflies were harmed in the making of these images. The small island of Iriomote-jima (西表島) in the far south of Japan is home to a beautiful beach called ‘star-sand beach’. 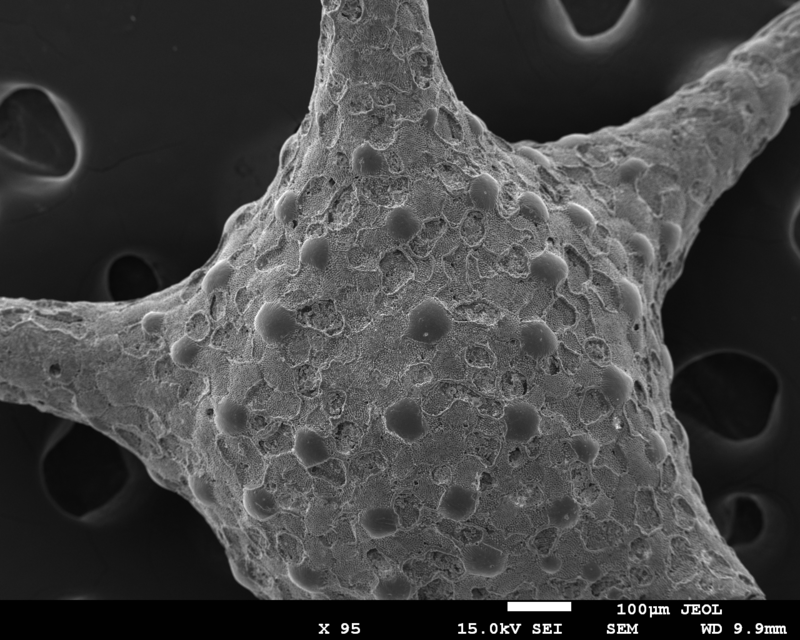 I collected a few grains of star sand when I was there in Golden Week of 2012 and brought them back to do some scanning electron microscopy. 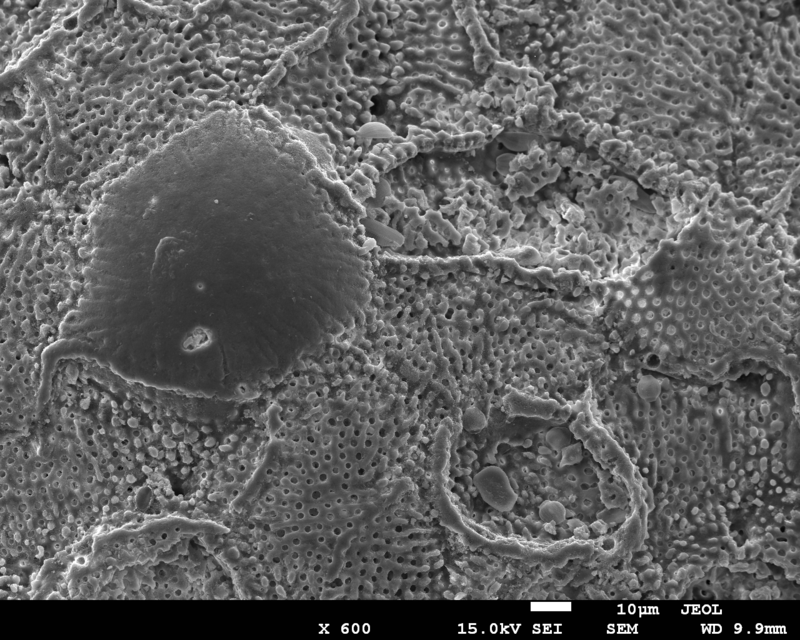 The star-shaped grains are actually the old inner shells of living organisms called foraminifera (forams). 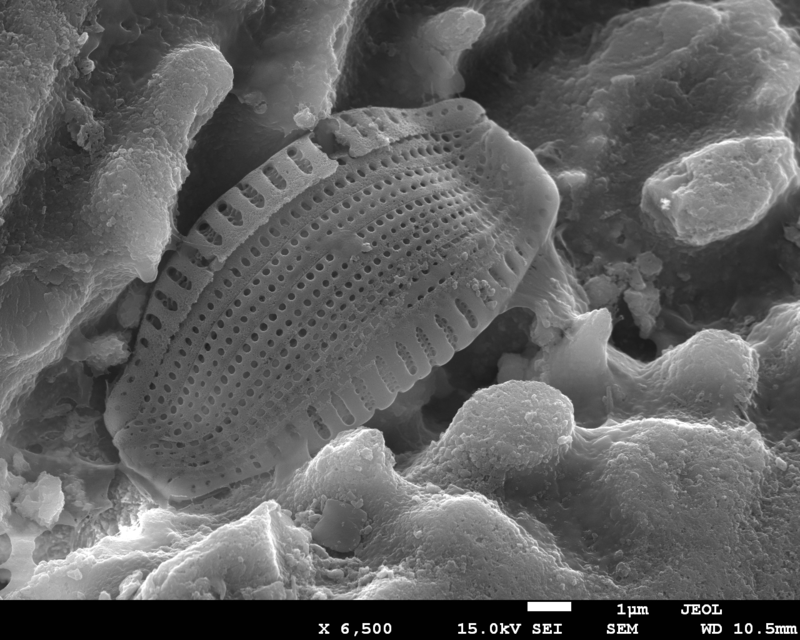 For more information on these beautiful little creatures, check out the website of this European project on foraminifera. The images below are all taken from a single organism. I have yet to find out what the holey oval shapes are in some of the later images. 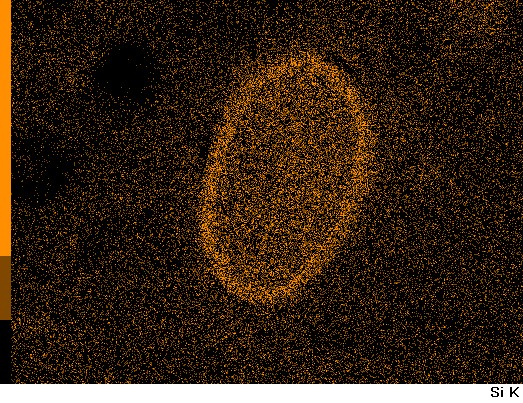 Energy dispersive X-ray analysis shows that it is silicon-based, rather than the calcium carbonate of the rest of the shell. 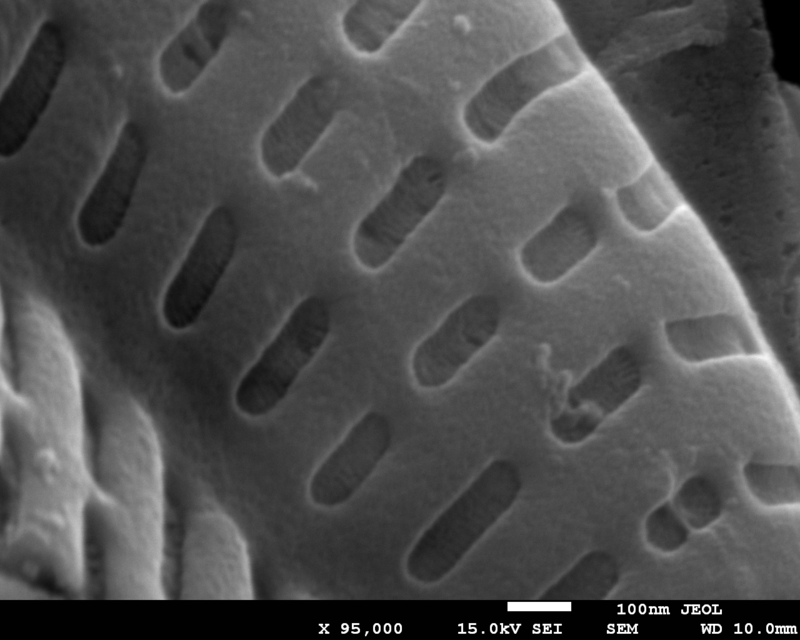 Newsflash – after a really interesting twitter conversation with @ForamsEU it seems that the intricate oval shapes in the final 7 images of this gallery are actually diatoms living in the test and strands of the foram. 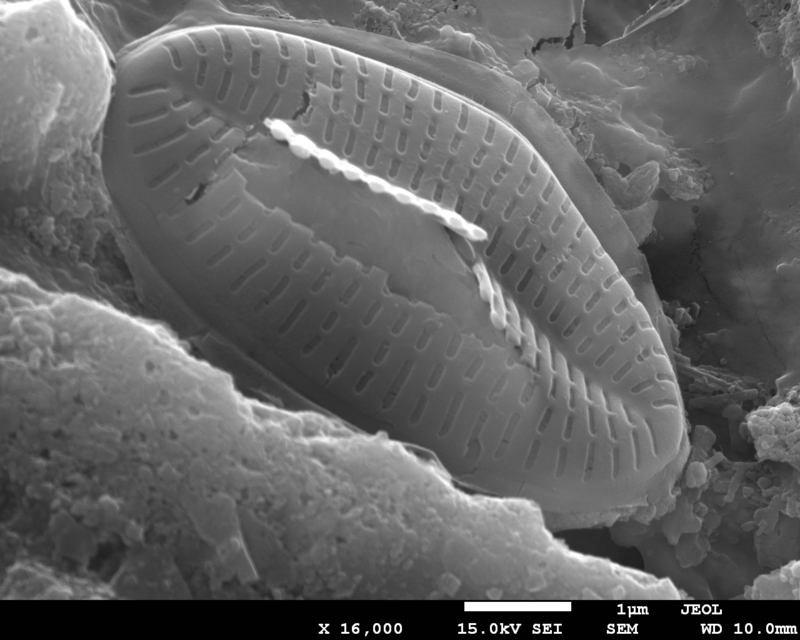 The diatoms die with the foram. Thanks for the extra info @Forams EU! I’m going to have to find some time to learn more about this! Watch this space.